bright lights and cameras and protocols. A stark contrast from the grim, grey morning outside. We spotted a few friends in the glare, sipped our tea and coffee, and tried to figure out what we ought to be doing by generally drifting around the room. 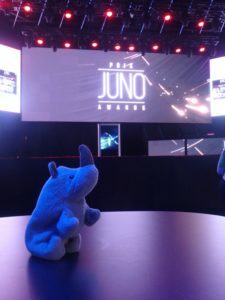 At exactly 11am the music amped up, the screens came to life and this year’s Juno nominees were announced. Yeah! 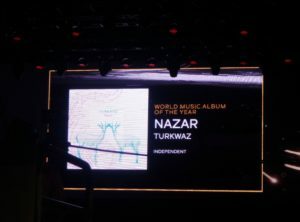 Turkwaz was there, nominated in the World Music category. Maryem was so excited I think she nearly floated to the ceiling on her celebratory mimosa. And what great company to find ourselves in. Also nominated were Lorraine Klaasen, Sultans of String, Okavango African Orchestra and Nomadica. * Actually, it’s more than just company, it’s a community of passionate explorers, blending traditions, keeping our pasts alive and making them relevant to the here and now. And to me it really doesn’t matter who wins, it’s the acknowledgement that the kind of music we do is valid and a vital part of the cultural fabric of our cities and our country. Not a lot of “world” music acts ever get to be household names in Canada, and we sure as heck aren’t doing it for the money. Many of us juggle other jobs and multiple bands to keep doing what we do. Why? Because we love it. I think the love shows. Here’s to the all the World Music Juno Nominees! * Full disclosure: I got to be a guest artist on Nomadica’s Dance of the Infidels and Demetri Petsalakis of Nomadica graced our album right back!